Basilica Cistern (Turkish: Yerebatan Sarnıcı – “Sunken Cistern”), is the largest of several hundred ancient cisterns that lie beneath the city of Istanbul, Turkey. The enlarged cistern provided water for the Great Palace of Constantinople and other buildings on the first Hill and continued to provide water to the Topkapi Palace after the Ottoman Conquest in 1453 and into modern times. It was opened as a museum in 1967. 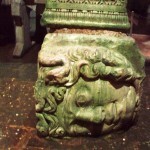 The two heads of Medusa as bases of two columns located in the northwest corner of the cistern. 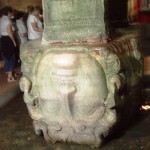 The origin of the two heads is unknown, though it is thought that the heads were brought to the cistern after being removed from a building of the late Roman period.